In February Google Analytics came out with a beta release of the Cohort Analysis. This report can be extremely useful in helping SEOs prove the value of new customer acquisition via organic search, show how they engaged with the site, and surface when they ended up converting over time. Even if the customer ended up converting through a non-organic channel like email or PPC. In this article we’ll take a quick glance of the components of the report, then break down how to use segments to help quantify SEO specific efforts. As seen below, the new Cohort Analysis report can be found by taking a look at the left-hand navigation in Google Analytics, under the Audience tab. The graph below is simply showing Goal Completions (number 3), over the Date Range specified (number 4), grouped by the date acquired (number 1 and 2), for U.S. customers coming to the site via organic search (Custom SEO Segments). To gain more insight into what’s happening for SEO, we have to limit this report to only results from users who came from organic search. Many of you are probably already familiar, but for others it isn’t the most intuitive experience in Google Analytics. Add, create, and remove segments by using the dropdown and plus sign. Begin by creating a new segment, click the plus sign above, then the red button that says New Segment. In order to get granular with SEO, let’s look at users only coming from Google Organic in the United States, and create separate segments for desktop, mobile, and tablet users. 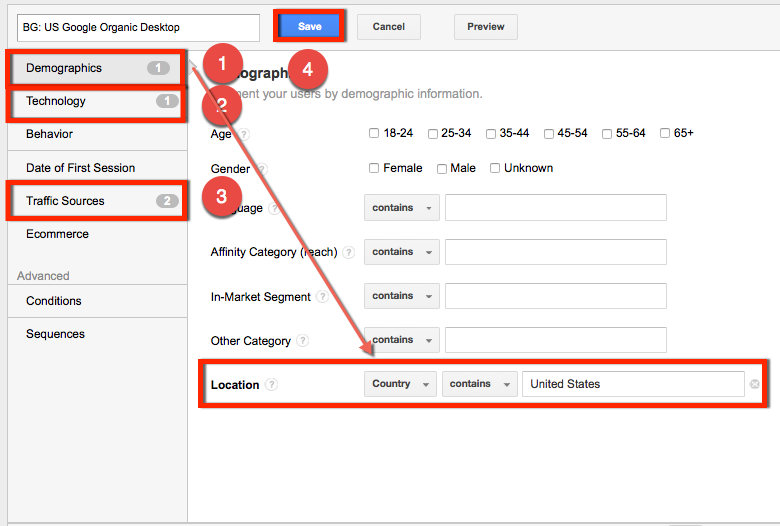 Use how we specified a location of United States for Demographics (1) shown below to input the appropriate configuration for the Technology tab (2), and Traffic Sources (3). In the end we’ll want the following specified. Demographics -> Location -> Country contains United States. Technology -> Device Category contains desktop (change this for each segment, mobile and tablet). Traffic Sources -> Medium contains organic. Traffic Sources -> Source contains google (this can be changed to create new segments for Bing and Yahoo). Once segments have been created, specify them within the Cohort report to reveal a much bigger story, as seen in the report below. For example on March 12, 2015, organic search brought in 2,157 new potential customers using their mobile device. Twenty-five of them converted on the first day, followed by two, two, zero, six, and four the days following. Perhaps an email campaign sent out on day four helped to convert the six additional users that initially came to the site using organic search, SEO should still get credit for the initial touch, and that is how this report can help better quantify SEO efforts. It’s possible to create segments that only include a specific page or a group of pages. Using this in conjunction with the Cohort Analysis report, helps to make it a great supplement to any existing SEO reporting.